"Street Fighter 2010: The Final Fight, released in Japan as 2010 Street Fighter, is a sci-fi-themed action platform game released by Capcom for the Nintendo Entertainment System in 1990. 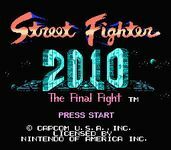 2010 was marketed in Japan and North America as a futuristic sequel to the 1987 arcade fighting game Street Fighter, although its story was rewritten for its English localization to further strengthen the connection between the two games." Source: Wikipedia, "Street_Fighter_2010," available under the CC-BY-SA License.